No. 6 UCLA hosted No. 15 San Diego State University on a sunny morning at the North Athletic Field. The Bruins were coming off a solid 16-12 win over UCSB the previous weekend, while the Aztecs beat the Gauchos on Friday afternoon 17-13. UCLA made a statement again this weekend, as they came away with a 20-11 win over SDSU. The win puts UCLA's season record at 10-1 with the current win streak at 9 games. The Bruins led the game from the first whistle, never allowing SDSU to tie the score or gain a lead for the entire 60 minutes. Fifteen minutes into the game, the Bruins were ahead 6-3, as UCLA midfielders won 70% of the draws. At the half, the score was 9-6 in favor of the Bruins. UCLA continued to put on the pressure, eventually opening up a 18-10 lead with 10 minutes left in the game. After slowing down the pace of the game, the Bruins won with a final score of 20-11 against the Aztecs. UCLA was led by the efforts of eight freshmen, who have made significant contributions all season. Rookies accounted for 18 of the 20 goals scored and handed out 7 assists on the day. Sophomore midfielder Sam Fletcher added two goals of her own, and junior attacker Ashley Payton notched one assist. On the defensive end, freshmen Jackie Adelsberg and Leigh Anne Fria helped to anchor a strong defensive effort that helped the Bruins transition the ball successfully to the attacking end. Senior goalkeeper Martine Ehrlich collected 12 saves and 2 ground balls to help hold the Aztec attack below their scoring average on the season. UCLA continued its dominance on the draw, as midfielder Sam Fletcher won 63.6% of draws taken at center, and notched 11 draw controls in the game. Freshmen midfielders Kristin Alexander and Annie Zwaschka added 6 and 3 draw controls respectively to help the Bruins maintain possession. Alexander finished the game with 6 points off 5 goals and 1 assist. 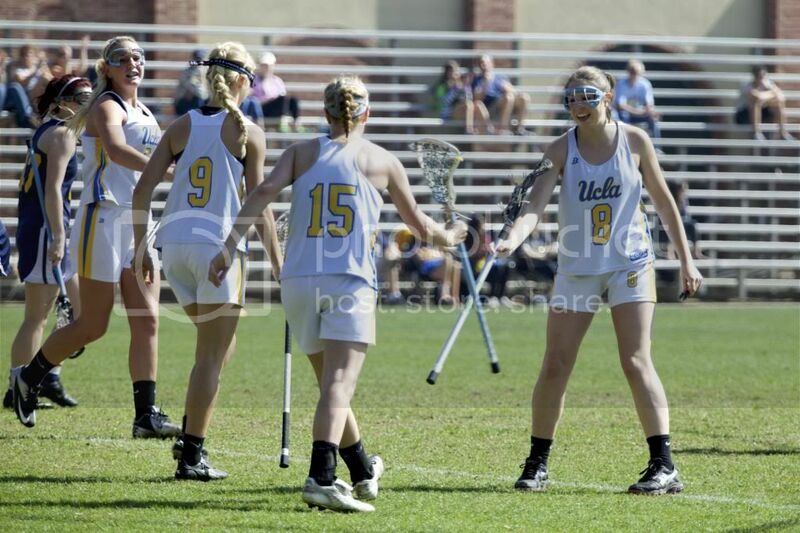 Fellow freshmen Chloe Silance (6 G, 2 A) and Emma Dudley (4 G, 1 A) also added hat tricks for UCLA. UCLA 'B' defeated Concordia University in a scrimmage 16-13 in the second game of the day. The Bruins are off for the next two weeks, as they head into final exams for winter quarter, followed by spring break. In the first week of April, UCLA 'A' will head to Utah to face national competition with games against BYU and Westminster. The Bruins will wrap up their season the following weekend by hosting USC for Senior Day.